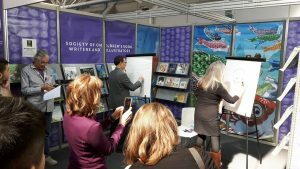 Illustrator Leslie Helakoski doing an art demo and book showcase in the SCBWI booth at the Bologna Book Fair. 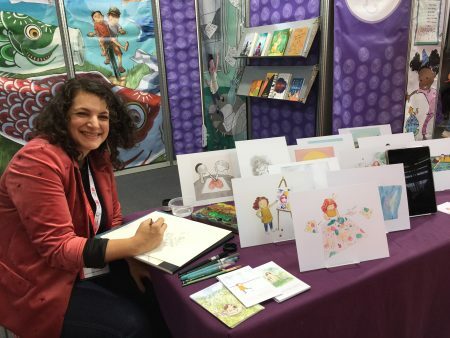 If you’re a writer or illustrator of children’s books, you may have heard about the Bologna Children’s Book Fair (BCBF on Facebook) that takes place each spring in Bologna, Italy. It is the largest children’s book fair in the world. Over 1,000 exhibitors and visitors from over 90 countries. For three days each spring, the halls of the convention center are filled with agents, editors, and publishers with their heads bent over small tables talking non-stop. Just what goes on at this international fair? What are all those editors and agents talking about? The Bologna fair is all about buying and selling foreign rights. 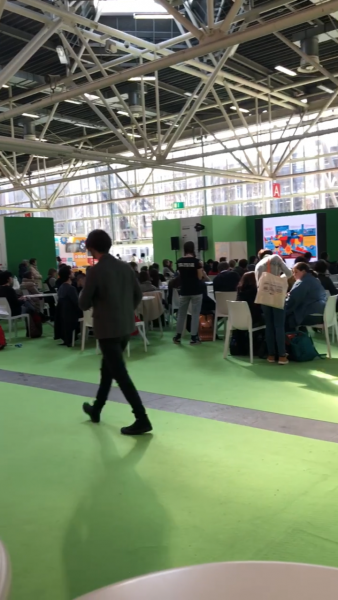 Bologna connects publishers and agents with editors and their foreign counterparts. It’s a great way for them to see what’s hot in different countries, promote books they represent, and try to sell the rights to foreign publishers. Editors come to meet with other editors and to gauge the market—what topics are popular, what are editors seeing a lot of and what is lacking. The fair is a haven for illustrators around the world, with the highlight (for me anyway) being the Illustrators Exhibition. Over 15,000 works of art are chosen by a prestigious international jury for display and circulation in the 2018 illustration annual.The show this year included 3,053 illustrators from 72 countries. Traditionally, very few from the U.S. make the cut but this year there were three Americans included. The Illustrator’s Survival Corner and Illustrator’s Cafe host world-known illustrators as well as authors and other pros from the industry who share expertise through classes, workshops and portfolio reviews. In addition, personal exhibitions of Ludwig Bolded and Manuel Marsol were displayed along with the special Exhibition of Chinese Illustration Art as China was the 2018 Guest of Honor. Meters and meters of blank wall space fills itself day after day with drawings, cards, proposals and contacts which sometimes lead to meetings and professional opportunities. Many publisher booths along with the SCBWI booth provided both scheduled and impromptu portfolio reviews. Excited and talented artists line up to get the chance for recognition and advice. Sarah Baker is the Director of Illustration and Artist Programs at the Society of Children’s Book Writers and Illustrators. This is the art demo and display area of the SCBWI booth. 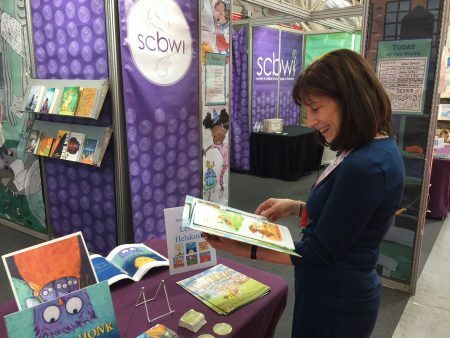 The SCBWI (Society of Children’s Book Writers and Illustrators) booth provides the opportunity for its members to have their books as part of their showcase display as well as a warm friendly place to say hello. For a small fee, members also have the opportunity to have their book in the digital catalog that is given out to hundreds of publishers and is also on display in the SCBWI booth. Members attending can also apply for a private showcase of their work for an hour. Illustrators are encouraged to include an art demo during their showcase which draws attention to the booth. SCBWI also hosts the much appreciated Dueling Illustrators activity. Two at a time, illustrators stand before large easel and listen to a new PB manuscript. The artists are given two minutes to sketch each scene. It’s a glimpse into the mind of how an illustrator tackles the first ideas words bring forth and to compare how different or similar their responses are. 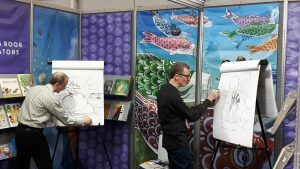 Two dueling illustrators, John Shelley and Paul O. Zelinsky, at the 2018 Bologna Children’s Book Fair going head to head in illustrating a new manuscript. A number of special awards are given with the most prestigious being awarded at the fair itself. This year, the Astrid Lindgren Memorial Award winner —which celebrates the winner’s entire work and humanist spirit, is American Jacqueline Woodson. And the Hans Christian Andersen Award, created to encourage the best of children’s publishing and promote its circulation throughout the world, winners were Eiko Kadono (author) from Japan and Igor Oleynikov from Russia (illustrator). There’s more, of course. Digital art demos, life-sized merchandising creatures roaming the halls, translated panels and discussions going on at all times. The price of admission is around $43 for one day, less for multiple days. It’s a bargain for the experience of the fair. And well worth it if you happen to be planning a trip to Italy. 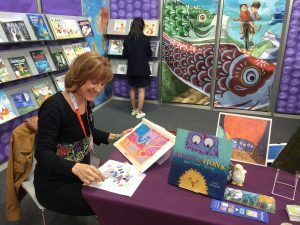 Jeanne B. de Sante Marie browsing at the 2018 Bologna Children’s Book Fair. Notice Leslie Helakoski’s HONK book! Author and illustrator Leslie Helakoski is the author of about ten children’s picture books. Along with Darcy Pattison, she teaches the popular PB&J: Picture Books and All that Jazz workshop at Highlights Foundation. Her popular character, Woolbur, returns in a new picture book in June, 2018. Leslie, thank you for an insightful post of what goes on at Bologna. I’ve always wondered what the hubbub was all about. It sounds like an amazing experience and what an incredible opportunity for illustrators. Thanks Darcy for allowing Leslie to guest post!